Our new groomer. Ready for snow. Our trail system is mostly a one way trail system for safety. We have narrow classic tracks and the hills are designed as either up or down hills and tracked that way for your safety. Please be considerate and safe and follow the "One Way" and "Do Not Enter" signs. Our Simple Map shows the direction of travel. March thaw, season's end for skiing. ​We have been able to secure funding from the Manistee Community Foundation for a new groomer and storage building for our equipment. We need some matching funds to receive the funding. Please see our DONATE page for ways to contribute! Fat Bikes: see Trail Conditions and grooming at Shoreline Cycling Club. Part of the summer mountain bike trail will be compacted and rolled for fat bikes during the winter. The total distance will be about 20 miles. The fat bike loops that were new in 2016 are: Gabriel's Horn, Shanty Boy, Road Monkey and Sky Pilot. Swedish Fiddle and Bindle Stiff will also be groomed. Grooming conditions are posted at the Shoreline Cycling Club website. Both user groups have separate trails and signage for directions. The button will bring you to a map of the trails. 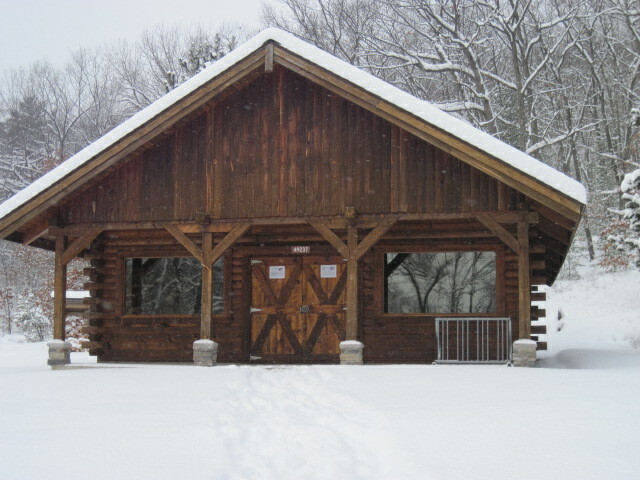 Big M is open for cross country skiing (and snowshoeing at the side of the groomed surface or anywhere in the forest) during the snow months. We are a machine groomed classic track trail system through the Manistee National Forest. 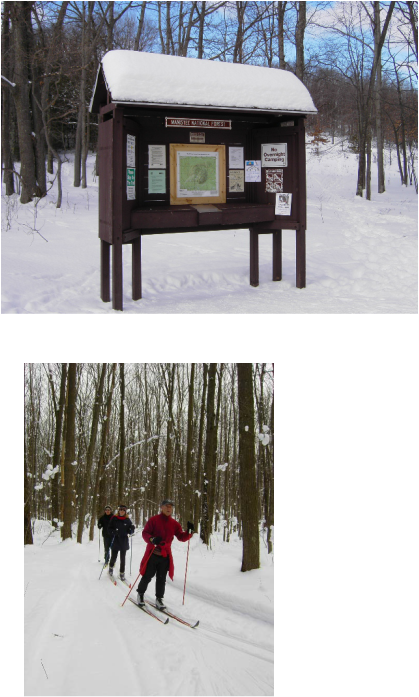 Our trails are not wide enough for skate skiing If you would like to skate ski see the Manistee Non-Motorized Trail System nearby. Big M is open for mountain biking during the spring, summer and fall. See the Shoreline Cycling Club website for more information. 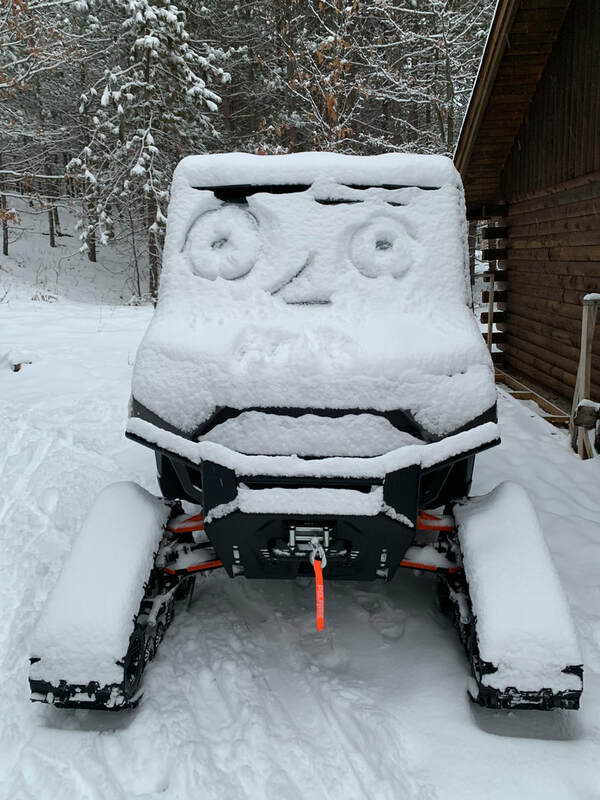 There are hundreds of miles of groomed snowmobile trails in our area near the towns around Kaleva, Wellston and Irons and further north in Benzie County. PLEASE STAY OFF OUR 35 KM TRAIL! See the Michigan Snowmobile Association website for information about snowmobile trails and grooming conditions. See Huron Manistee Forest Service Contact the Forest Service for areas where you are welcome to ride your snowmobile. Our trail shelter, open all the time. Come and build a fire in the woodstove and warm yourself after skiing. Usually someone builds a fire every weekend day. 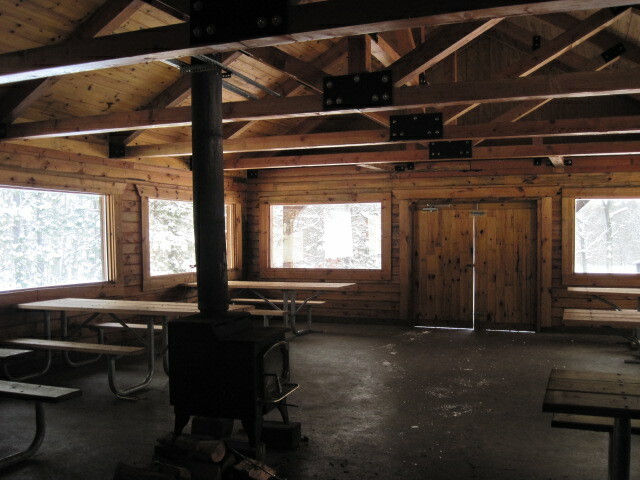 Trail Shelter, inside. You can build a fire, firewood provided at Big M. You may want to bring kindling or find it in the woods.